It's 9:00 pm, the hubbub of the city looms like a distant dream in the quiet airy lakeside of Shahidullah Hall, one of the 17 residential halls of the University of Dhaka (DU). Groups of boys squat on the grass here and there, absorbed in the most favorite pastime for any university student: chitchat. In front of the tea stalls, a heated argument rises in a group of 10, as if a war will almost issue between the two World Cup favourites: Brazil and Argentina. However, at the stroke of midnight the argument dies down, but it is not until 2am that the lakeside becomes completely quiet. A similar picture is drawn by Faisal, final year student of Bangladesh University of Technology (BUET). He says, “Night life at the halls is always intriguing except those before the exams.” BUET students usually carry heavy study loads from Saturday to Wednesday. From Wednesday night the fun starts, which among other things includes “fights” -- a BUET terminology referring to hours spent on Facebook and over cell phones. Late night food adventures add to the fun when groups of boys are seen delving into paratha, kebab and biriyani at Chankharpool, Nazirabazar, Becharam Deuri and other popular joints of Old Dhaka. For girls staying in the campus, the Cinderella rule still applies. In most female halls, the gates are closed by 9:30pm to 10:00pm. As a result, socialising is limited within the boundaries of the hall. For Deborati, a 4th year student of BUET, fun entails movie night, spending time on the computer, hall-based programmes and chatting with friends. Tanzia and Shakila, 2nd year geography students from Jahangirnagar University (JU)'s Pritilata hall are engaged in a mock fight with their male friends. The young men brag about how they can roam around the huge scenic campus enjoying the reflection of the full moon on the clear water of the lake while girls have to be content with the view of the open sky above their lawns, within the four walls of the halls. Kotha, a final year student of mass communication journalism (MCJ) staying at Shamsunnahar Hall at DU thinks that like the men's hall there should be no gate closing time at the women's hall. She says, “We are all grown ups now. If anyone ventures out at night, that should be her choice. There should not be any bindings on that.” Tanzia from Pritilata Hall thinks that the restrictions are imposed mainly because the authorities fear that parents and guardians may hold the university responsible if anything happens to their daughters. She says, “Some of my relatives exclaim in concern when they hear I live and study at JU.” According to Ryan, a student of Bengali department of JU, misrepresentation by the media is largely responsible for the preconceived notion about the character of JU students. “The fact that we raise our voice against sexual harassment often works to our disadvantage because of how the media cover the story,” says Ryan. Movement against injustice is inherent to public universities irrespective of the power and position of the wrongdoers. Sohel from Peace and Conflict Studies, DU thinks that outsiders mainly carry out inappropriate social behaviour. He says that recently announcements about safety measures are made in the evenings asking outsiders to leave the campus area. Ryan from JU states that sometimes newcomers behave inappropriately but with guidance from their seniors they change their attitude. In private university premises security measures are extremely tight, as a result unwarranted incidents by outsiders hardly ever occur. Equivalent security measures are not possible in the open campuses of the public universities. The University of Dhaka is not only for its students; people from all walks of life gather here in any festival like Pohela Phalgun and Pohela Boishakh. Jahangirnagar has its own unique festivals like the “Mohua Utshob”, based on the blossom of the Mohua flower and introduced by the famous litterateur Dr. Selim-Al-Din. “When the Mohua flower comes to blossom we celebrate it with song and dances,” says Pollob from the anthropology department of JU. Besides the liberal environment of NSU, students are happy about the facilities available at their campus, one of which is uninterrupted electricity. In terms of constant power supply BUET students appear to be the most satisfied. Shamim, 4th year BUET student says, “From 12pm to 8am DESCO supplies power, the rest of the time our own two mega watt sub-station supplies electricity to BUET.” JU students are not as fortunate as the NSU and DU students in terms of power shortage. Jahangirnagar receives its electricity from Polli Bidyut and from the beginning of the current year, load shedding has become a regular menace. Students mainly study at night but power cuts are hampering their daily study routine. Pollob, living in Bangabandhu Hall at JU says “Authorities even announced that from 5pm to 7pm there would not be any electricity. Yet they could not prevent load shedding at night time.” However, power cuts bring in a different kind of fun for boys living in JU's Kamaluddin and Shaheed Salam Barkat Hall that stand on either side of a road. The moment electricity goes off at night, all the dormitory boys of these halls gather in the blocks that face each other and start calling names, until power returns. “It is almost impossible to pass through the road during that time with your ears open,” laughs Shakila, 2nd year geography student of JU. DU students have mixed feelings about things like cleanliness of the campus area, cafeteria, department and hall toilets. Interestingly, most students interviewed think that cleaning staff are regular in their work. However, it is the age-old buildings and the increasing number of students that makes maintenance difficult. NSU, with its huge, brand new campus looks almost spotless and a stark contrast to the ill-maintained buildings of public universities. Pankaj, resident of Jagannath Hall, where all non-Muslim boys of DU are allocated seats, presents the hygiene problem in a different light. He says that all non-Muslim staff of DU are also housed on the Jagannath Hall premises. The huge number of staff along with their extended families overburdens the sanitation capacity of the hall. He says, “Our hall premise has almost turned into a slum since the family of the staff members are often not educated and lacks sanitation awareness.” Kotha of Shamsunnahar Hall says, “Our bathrooms are cleaned regularly. But the buildings are so old that the floor remains damp. The bathroom pipes have not been cleaned for ages, making them safe havens for insects and rats.” The age of the building also threatens the life of its residents, says Pankaj, referring to the dilapidated condition of Jagannath Hall. He recalls the tragedy of October 15, when on a rainy night in 1985 the roof of the common room of Jagannath Hall came crashing down on the students, killing almost 40 students and staff. Although a new building has been constructed in that place the other two existing buildings are still vulnerable. “At any time another tragedy like 15th of October can take place this time killing hundreds,” says Pankaj. Students who live on the second and third floors of the men's hall at JU live in a cleaner and more hygienic surroundings. However, for those living in the ground floor, water logging in the toilets is a constant menace, mainly because the pipes are not cleaned regularly. The nice pond in front of Bhasani Hall is being polluted by the sewerage lines of the building and also by dumping waste. Nevertheless, littering on the campus premise is not rampant because of the red bamboo waste-paper baskets present at different points along the roadsides. The women's halls including the Gono-rooms (makeshift accommodations) are tidier and cleaner. Gono-rooms are an invention of the public university authorities in an attempt to accommodate the growing number of students in the congested halls. 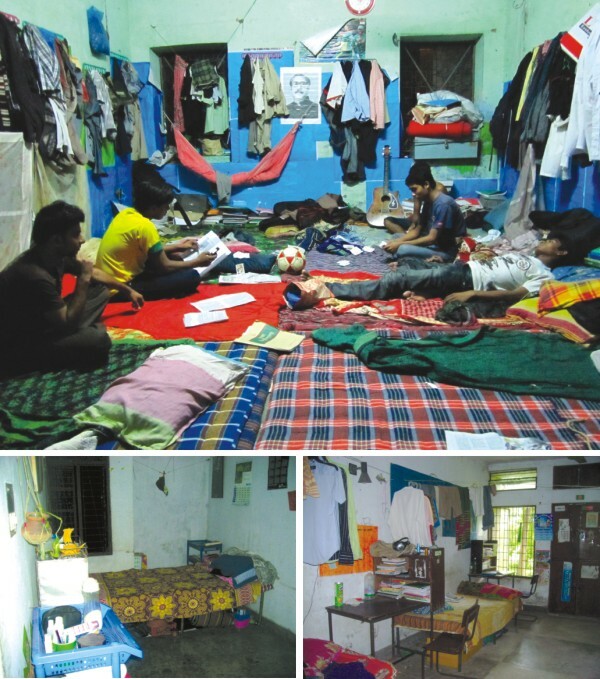 Anannya, an MBA student living at Begum Fazilatunnesa Mujib Hall, DU, informs that there is a gono-room called Mohona, where students can stay in return for a fee. “It is a large hall room with bunk beds,” she says. Although students have to pay extra money for staying at Mohana, she thinks that the system is good for security reasons. Otherwise first year female students who mainly come from outside Dhaka either have to stay in their relatives' places or rent houses near the campus. At DU, hall seat allocation is merit-based, as there is a huge gap between the availability of seats and the total intake. However, without political influence, getting a seat in the hall is quite a challenge in the first year. Kotha, of MCJ says, “I had to wait one entire year before boarding my seat at Shamsunnahar Hall. Even then I had to do 'doubling -- a term used in public universities to mean sharing a three-foot bed by two students.” Students who do not leave the hall even after completing their Masters amplify the problem. Using their political influence they often stay back in the halls, which amounts to free accommodation in a city where accommodation is very expensive. Communal harmony, in both the private and public universities is a given. In fact Pankaj living in Jagannath Hall thinks there should be no special halls for non-Muslim students. At JU and the women's halls of DU there is no such segregation. In JU, any kind of religious fanaticism is not tolerated. On the other hand, although there is no politics at NSU campus, some NSU students have been members of extreme religious groups. BUET halls on the other hand, are virtually free from political influence. Shimon, final year student of BUET says, “Hall allocation depends on the number of running batches at BUET. If this is less than five then seat problems do not occur.” Unfortunately, BUET women students are not that lucky; the only women's hall cannot accommodate the increasing number of female students, who stay on the floor in the common room. At public universities for many students, joining some political party or another is almost compulsory. Even if the only student leaders with a powerful presence in the hall belong to the ruling party, there are different factions. Starting from the very first day, supporters of the rival factions within the same party engage in a competition to win over as many supporters as possible. For freshers, it is a tricky business to choose sides. For others, leaving politics is hardly a priority. Once again, achieving this not so-respectable position in society, nevertheless provides youngsters with a sense of power. The wild aspirations for the future, moreover, requires gaining the trust of the right “Bara bhais (Big Brothers)”. Those who succeed are given the responsibility of keeping and maintaining the firearms. Firearms have been a significant factor in shaping campus politics. New hands at student politics, who have gained the trust of the “Bara bhais”, are often given training on how to handle firearms. One of the preferred training spots at DU are the roofs of the residential halls. The practice normally takes place on special occasions like the New Year or Shab-e-Barat when the loud bang of the firearms might be passed off as firecrackers. The sinister presence of student politics can be felt everywhere from lodging to food at public universities. Toilets at the men's hall. Most students of the public universities prefer to eat outside the university hall dining and canteen. Although the price is higher, they get better quality and variety. For JU students Bat-tala and Meher Chattar are favourite eating spots, while many DU students prefer Madhur Canteen not for the food quality but for the tradition that goes with the place. Although the quality and price of the food at NSU's cafeteria is satisfactory, the students miss the variety of cuisine of Banani Road 11, since they moved to the new campus. The chronicles of campus remain incomplete without the mention of the most important thing: education and the ultimate goal of building a career. As the final year approaches, depression and hopelessness descend upon many students of the public universities. This is especially true for the students of Arts Faculty who are worried about their future prospects in the job market. Those who had once led a carefree life on campus, bunking classes to chat with friends, become serious as final exams draw near. Selim, an Arts Faculty student, has wasted many valuable years loitering on the campus, engaging in student politics and gossiping with friends. “None of this will help build my career. I feel that I have just wasted the prime years of my life. If I could go back in time I would not repeat the mistakes.” Some of the best students in Bangladesh come to DU. Sadly, by the time they finish their studies, many lose their commitment to gaining knowledge after being exposed to some of the negativities of campus life. Although from a distance the JU students appear to live a laid back life, study pressures are present in subjects like geography, archeology and anthropology because of the field and library work. Most of the JU students interviewed, however, aspire to join the teaching profession or prefer to work in the development sector. NSU students are generally more serious about their studies. The educational system leaves them with no alternative but to work hard and achieve good results. It is a tough and stressful life. But once an NSU student graduates with good results, there is no stopping him or her from the job market. Students playing cards at TSC, DU.